Poodle shirts popular in the 1950s, are still a fun project to make for everyday retro clothing, Halloween, or other special occasions. This is a guide about making a poodle skirt. Question: How Do I Make a Poodle Skirt? My 13 year old daughter is going to a fifties party and we can't afford to rent a costume, do you have any tips for making a (green) poodle skirt? You can buy patterns to do this. I did it several years ago for one of my grandaughters. This was about 12 years ago.If you buy a pattern you will have it for several years, if you need it again. I just got rid of mine a few months a ago. I bought a poodle iron on applique and used metallic gold cording that ran from the poodle's neck to the waist band, where I sewed it underneath the band. I also made the skirt a full circle, just like most of them were in the fifties. I was a teen ager in that era. I am assuming you are talking about the amount of fabric. A shower curtain from dollar tree or 99 cent store, might need 2, one for front one for back. You might find curtain or bed sheet at Thrift store. The poodle can be cut from felt square and the leash could be a necklace or again a leash from 99 cent store. Hope this helps. When do you need it by? What size is she? I have 3 in my basement that you can have. They are purple. Please let me know where to send it to. If it is not necessary to be strictly true to the authentic poodle skirt, then do what I did. I went to a thrift store and bought a plain cotton elastic waist skirt in red. Using assorted sized pompoms and felt I made a black poodle and glued it with fabric glue to the right side near the bottom. I even added a ribbon leash. I had many compliments. Have you considered round tablecloths? Cut a waist hole and a short slit, based on the guests waist measurement. Fraycheck the cut edges and add a velcro dot at the top of the slit to close it. Do glue on felt poodles or the pom ones described above. Have fun and rock it! We are hosting a 1950's Rock 'n Roll theme for my daughter's surprise 13th birthday. I would like to make some poodle skirts and can't seem to find a free pattern that doesn't ask for felt. I cannot find felt in that large of an amount in my area. Plus I would like that it is either an elastic waist band or Velcro closure to accommodate the different sizes of our party guests. I figured it would make a fun party favor for them to take them home afterwards. Please help all you sewers and crafters out there. Thanks in advance. Those will be expensive party favors, if made true to the originals. Most fabric stores will have felt wide enough to make a poodle skirt. They might not have enough of one color to make all of the skirts the same color. But they wouldn't have to be the same color. What did you plan on using for the poodle applique. If you buy them they are quite expensive. Any skirt even similar to what the poodle skirts were won't have an elastic waist band. You could use velcro for the closure instead of a button, but it still probably wouldn't fit every size. Any waistband that has a closure on it will require a 7" zipper. Also you should have at least one layer of nylon net under the skirt to represent a can-can slip. I was in high school in the fifties and am very familiar with that type of skirt. Although very few of the girls had actual poodle skirts, we all just had lots of very full skirts that we wore a whole lot of can-cans under. They were so full that when we wore a full length coat in the winter, where the buttons stopped, our skirts stuck way out. If you go to a party supply store you could probably find some cute 50s style party decorations and favors, that would be a lot less expensive than the skirts. RedHatterB is right, those could be some expensive party favours! But you might be able to run up some skirts if you are willing to use recycled fabrics like sheets from a thrift shop, and using the poodle pattern with a white sheet-you would turn under the raw edge and then sew it to the skirt panel, instead of using felt that wouldn't need the raw edges finished. You're going for the look, right, not historical accuracy? For the waist band, simply fold over and make a casing with an opening after you've sewn the panels together. Then insert a drawstring-elastic cord through the opening. To make the drawstring-elastic cord, you cut a piece of waistband elastic 12-18" long, sew drawstring cords to each end of the elastic, and then thread that through the casing. Try to figure out the average waist and hips of the girls invited, and make the skirts big enough to go over the biggest girl's hips. The thing about poodle skirts, though, is that crinoline petticoats made the skirts pouff out and gave the skirt that cute flouncy flare. You might consider using cheap nylon net (around $1.50 a yard) to line the skirts; the gathering effect from the drawstring being tightened might give enough of the flare to please the girls. Good luck, it does sound like a cute idea, but it could go costly very quickly! The pattern (see the image I upload) is a simple circle. It's cut in two half-circles to do not waste material. Inner circle : measure your waist, divide the waist measure by 3.14 you get the diameter of the inner circle, divide the result by 2 you get the radius. Example : waist size: 60 cm divided by 3.14 = 19 centimetres divided by 2 = 9.5 centimetres. 9,5 is the radius. 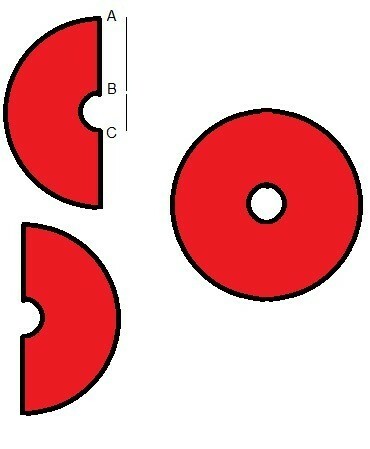 On the pattern line BC is the diameter, radius is half of the diameter or center of BC. To draw the second circle: measure from your waist down to the desired lenght of the skirt, to the knee or to the calf + hem. Add the radius of the first circle to that measure. You can now draw the second circle from the center of the first circle. Cut an opening for the zip and sew a bias round the waist and the hem at the skirt bottom. And that's all !